Colonel Roy Potter’s newly released video headlines “More Evidence Gillespie Planned Slaughter,” referring to the so-called Sheriff that could have and should have stepped in to prevent the Bureau of Land Management from abusing Cliven Bundy supporters in the highly publicized “Range War,” where the BLM federal agents threw a pregnant woman to the ground, slaughtered prized bulls, sectioned off areas declaring them “First Amendment” areas, leaving a trail of death and destruction, while the Sheriff did nothing to prevent what could have easily become the beginning a civil war. 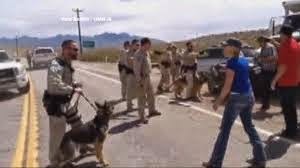 A slaughter that Colonel Potter asserts Sheriff Gillespie planned, expected and wanted, which fully explains why when things were getting completely out of control, Gillespie was nowhere to be found until the BLM backed off, then he showed up…. after the fact. Indeed, it now is nearly certain Sheriff Gillespie was at the forefront of a master plan to bring about a false flag event of 911 proportions. Below Colonel Potter’s video is the one referenced in the Western Journalism piece Potter linked in his details.